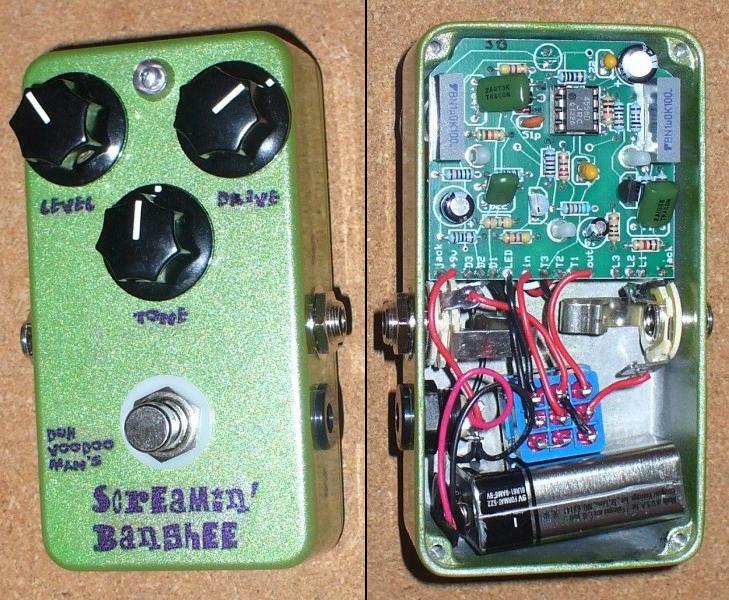 The Screamin' Banshee Overdrive is a straightforward build of the BYOC Overdrive, although the one pictured below was installed in a smaller 1290NS enclosure, rather than the slightly larger and more familiar 125B size that BYOC includes in their kits. As such, it's a direct clone of the legendary Ibanez Tube Screamer TS-808 circuit, with a few improvements. For more details on the BYOC Overdrive and its revered progenitor, see my ZYS page. This particular pedal was built using asymmetric silicon diode clipping. Beyond that, it's the "plain vanilla" BYOC kit construction in the smaller enclosure. Though I made it work, I do NOT recommend this enclosure size for these pedals. The fit is just too tight. If your hole-drilling in the casing isn't exactly right, you'll have trouble getting the thing assembled. Note how the battery is installed at an angle; this was the only way I could get everything in. So do yourself a favor and stick with the 125B sized enclosure if you build one of these. This pedal has a nice transparent TS-808 tone and can be made for a fraction of what Ibanez gets for their TS-808 Reissue pedal ($170!). The BYOC Overdrive makes a nice "first project" for someone wanting to give kit-based pedal-building a try. If you have semi-decent soldering skills and can follow directions accurately, you should have no problem building one of these.